Mainstream companies that make menstrual products usually avoid red like the plague! Would you like to see brown on your toilet paper wrapper? Dr. Lillian Gilbreth noted as early as 1927 the frequent use of blue on pad boxes [read much of her fascinating report for Johnson & Johnson], maybe leading the woman's thoughts to the sky above rather than to blood below. 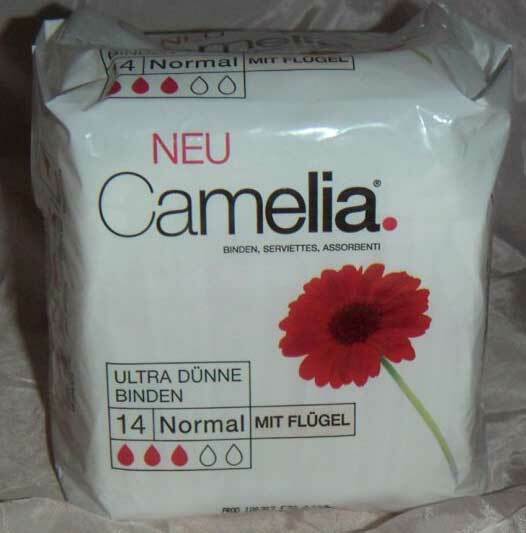 Recently, though, some manufacturers have been coming to terms with menstruation, as we see with this Camelia package, below. Actually, the first Kotex ad campaign, in the early 1920s in America, plastered the Kotex name on boxcars (here) and trucks as well as store windows (here), but this boldness disappeared during the 1920s only to revive with smaller companies in the 1970s and beyond. Some people were tired of covering up the obvious and encouraging women's shame. 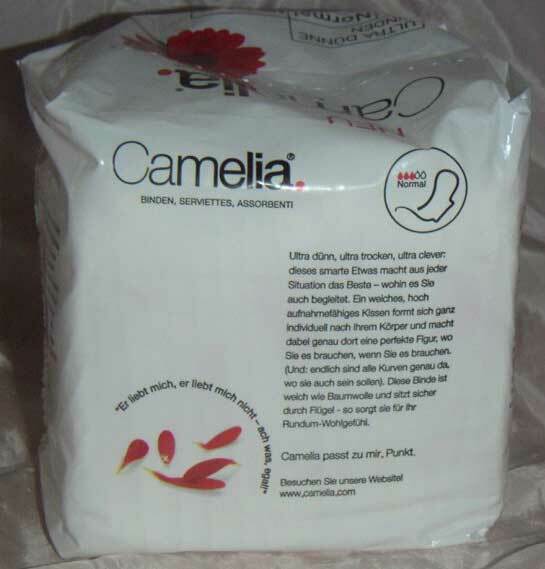 Camelia created the first really successful disposable pad in Germany just after Kotex did in America, although both countries had much earlier predecessors (Hartmann's in Germany, and Lister's Towels, from Johnson & Johnson, in America, both from the 1890s). Germans call the camellia Kamelie, so the company name is a hybrid - assuming they intended it to mean the flower. That seems obvious. Manufacturers have long used flowers with menstrual products. "Flowers" itself is an ancient English term for menstruation, although it means "flowing," not the beauties in your garden; read a discussion about this. But one male writer likens the menstrual odor to marigolds, and I think the botanical flowers help women feel good things when she muses about that time of the month - flowers are "feminine," but a dainty femininity, not like menstruation! It's the opposite of what people usually think it. Menstrual cups are themselves tulip shaped, and an early seller exploited that (see here) rather than show the cup itself. Look how far the company has come since this early Camelia ad from the 1920s, with Nurse Thekla wagging her finger at you! Women found a slip of paper in the box that they could give to a female clerk instead of speaking to her; the slip asked the clerk to sell her a box of Camelia! And Modess pads used the gimmick at the same time in America with its "silent purchase" coupon (see it here), women clipping the coupon out of a magazine ad. Customers often see New - here, NEU - on menstrual product packaging and I wonder if it relates to the inability of pads and tampons to satisfy many women, since periods are often unpredictable. Dissatisfied, she sees an allegedly new pad in the supermarket: "Maybe this new one will work," she says to herself, and buys it. Hm, the company stole the red dot from the American Kotex magazine campaign! But not if Kotex owns Camelia, which it does! So two early menstrual pad companies are now one, as is their advertising. Women in Germany also use period (Periode) to refer to periods, but say Punkt to mean the dot at the end of a sentence (look at the bottom picture on this page). I don't know if that part of the campaign translates. Ich war sehr überrascht als ich die Farbe ROT in dem Regal mit Damenhygiene auffand, vor allem in so einer Kombination mit weiß, da die Blume eindeutig wie ein "Fleck" wirkt, wie Sie auf dem Bild erkennen können. Auch die verpackung der Binde selber und der "Streifen" auf der Rückseite der Binde weist rote Konturen von Alltagsgegenständen auf (z.B. Lippenstift, Handtasche e.t.c.) , welche auch wie rot gefärbte Flecken wirken. Ich habe einige Bilder von diesem Produkt gemacht denn ich fand die Verpackung wirklich einzigartig wenn man sie mit anderen Damenhygieneprodukten vergleicht welche meist türkis oder blau verpackt sind (z.b. "Always"). I was very surprised to find the color RED on the [store's] shelf of feminine hygiene products, and above all in combination with white, because the flower unequivocally acts as a "stain," as you can see in the picture. The packaging of the pad itself and the strips on the back of the pad have red outlines of everyday things (lipstick, hand bag, etc., that also appear to be red stains. I've made some pictures of the product because I found packaging truly unique when compared with other feminine hygiene products, which mostly have turquoise or blue packaging (for example, Always). Lower picture: At lower left you see in German, above the blood-drop leaves, "He loves, he loves me not - aw, so what!" The drop-leaves repeat on the indications of pad absorbency, the red and hollow drops, at upper right and in the top photo. "Camelia passt zu mir, Punkt," at bottom right, means "Camelia fits me, period." But Punkt doesn't convey the message Periode would - but that's impossible in German. See the sides of the package and the pad design. See a Hitler-era Camelia ad, and others.